Evolution Design designed the new offices for Dutch telecom company, VodafoneZiggo located in Rotterdam, Netherlands. When you think of a call center you probably picture a line of people seated in row upon row of desks in a featureless back room. But call centers are changing. In many companies, they are now the first point of contact with customers and are increasingly important in growing new business and ensuring customer satisfaction. High tech and fast paced, with multiple contact points from email and messaging systems to video and voice calls, they also require motivated and well-trained staff. As companies recognize their growing importance, the boiler room approach is disappearing and call centers are beginning to morph into a corporate centerpiece. Dutch telecoms company Ziggo is a case in point. The company merged with Vodafone in 2017 and today offers broadband and mobile services to both residential and commercial customers across the Netherlands. It has a large call center and like many companies invests significant resources in training call center employees in both technology and interpersonal skills. But staff retention remains a key issue and the company asked Swiss design and architecture practice Evolution Design to look at how workplace design could help motivate employees and reduce turnover. 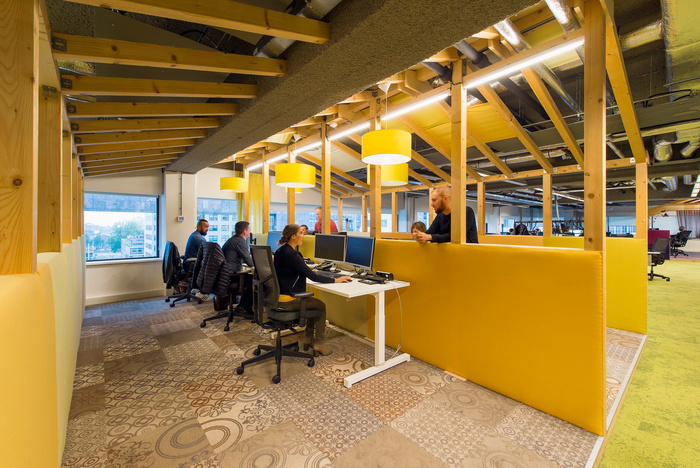 VodafoneZiggo’s call center is spread over several large open plan areas, which Evolution Design converted into series of smaller work spaces, using low cost solutions such as simple wooden frames, acoustic panelling or a change of flooring to demarcate different zones. 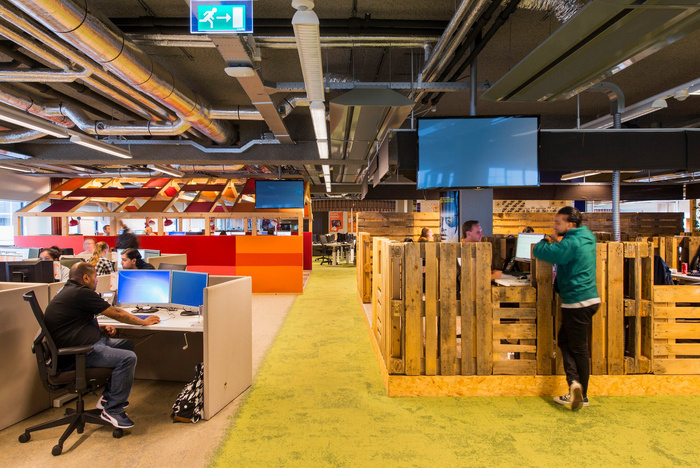 Staff can now choose to work in areas as diverse as a plant covered ‘greenhouse’, open plan spaces with bright yellow accents and colorful floor tiles or in a more urban-style zone that uses reclaimed wooden pallets to divide and decorate. Throughout the center, desks are height adjustable so employees can choose whether to sit or stand. Evolution’s design also includes a central reception area with meeting and training rooms and a colorful break out space with comfortable sofas, a café and a games zone complete with table football and video games.